Soda Canyon Road | Napa City's Oak Woodlands - saved! Napa City's Oak Woodlands - saved! The City Council has voted 3 to 2 to deny the request to rezone the Napa Oaks property, thus rejecting the Napa Oaks II proposal. Napa CofC LTE 6/16/18: Can we decide without divide? Keith Lindstrom LTE 6/14/18: No to Napa Oaks - report proves we have plenty of existing land zoned for housing. Stop Napa Oaks has sent out this reminder that the Napa City Council will be deciding the fate of the Napa Oaks II project on Tuesday, June 19th at 6:30pm. SNO 12/21/17: Planning Commissioners vote in a 3-2 split in our favor! Eve Kahn: Do we want to destroy our hillsides? Stop Napa Oaks sends this notice after the 11/28/17 presentation hosted by the developers of the 53 unit Napa Oaks housing subdivision slated to replace the oak-covered hillside on the west side of town (pictured). The project will be heard by the Napa City Planning Commission on Dec 7th 2017, with a decision on the project to be rendered in the new year. A clash between tourism urbanization and housing urbanization: The natural landscape of the county loses both ways. 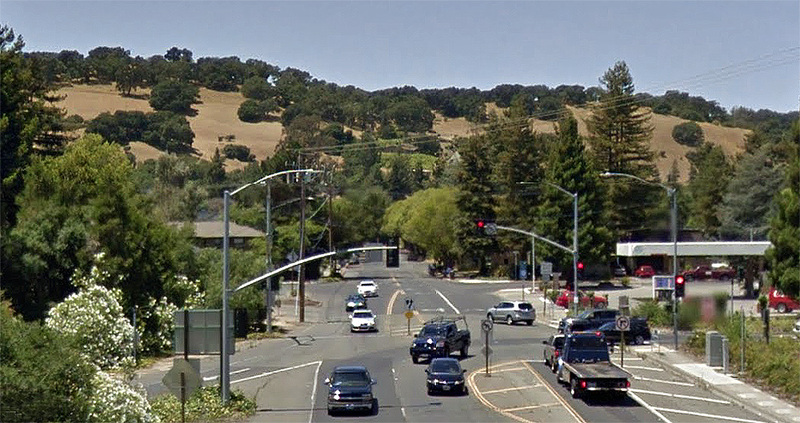 The Napa Oaks site should never have been incorporated into the city limits and the housing project is the infinitely more egregious insult to the rural character of the county. The site plan, which shows the tops of the hills being sheared off for building pads, is truly heartbreaking. Let's pray they lose the coming battle with their city neighbors to the east and the Truchards (who seem to be the county ideal of the family farm vintner) to the west. The housing developer's letter does just look like harassment in retaliation for the Truchard's opposition to their project. (The Truchard's opposition letter (at the bottom here), however, is a dead ringer for all of the letters we have written opposing tourism wineries these last 3 years). The best outcome, of course, would be for both to abandon their development plans in order to preserve "the sheer natural beauty of this place". The Greenbelt Alliance, an organization dedicated to preserving open space in an urbanizing world for 60 years, has just issued a 2017 report At Risk: The Bay Area Green Belt which features the Napa Oaks Project as open space under threat of development. (No mention of Walt Ranch?) More here from the Stop Napa Oaks group. In true developer fashion this project is named for the environment it destroys. (I grew up in an LA suburb called Sherman Oaks, none of which remained). A part of the oak studded hills that define the rural character of the Napa Valley is to be littered with suburban McMansions. The immediate question when looking at Google maps is why this parcel is within the city limits, surrounded as it is on 3 sides by identical county open space. Not as bad as the absurd Napa gerrymander of Stanly Ranch, but still one of those unfortunate bumps in the urban-rural line that just invites urban expansion into the countryside. The battles of communities throughout the county these last two years to maintain what is left of Napa's rural character in the face of a resurgence in developer zeal and money has been both heartening, because the desire still exists to retain this place as separate from the rest of the suburban sprawl of the bay area, and discouraging in that governments seem ever more willing to sacrifice that character to developers' interests.